Big, bold barbecue flavors make these oven roasted barbecue potato wedges an incredibly delicious side to any meal. They are seasoned perfectly with a crispy exterior and soft, almost buttery insides! Like your favorite BBQ potato chips, they are hard to resist once you get started! Wash the potatoes well, then slice into wedges, either by cutting the potatoes into fourths or eighths, depending on how large your potatoes are. In a small bowl, combine all of the spices. 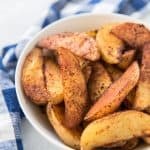 Drizzle the potato wedges generously with olive oil and toss to coat, then sprinkle with the barbecue seasoning blend and toss again until all of the spices are evenly distributed. Spread the potatoes out on a large baking sheet so they are in a single layer. Bake for 40-45 minutes, or until fork-tender with browned, crispy exteriors. Remove from oven and serve immediately. You can really use any kind of potato with this recipe, although red potatoes and Yukon golds are my favorites. But Russett's work as well if that's what you have on hand.